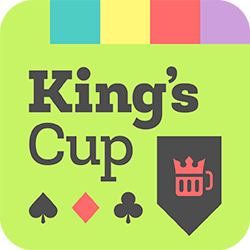 King of Booze: King’s Cup is a drinking game that can be played with 2 players and more. It’s an ideal party game to start the night. The game is also known as Ring of Fire, Kings, or Oval of Fire. Each card has a rule attached to it, simply follow the rules on the cards to have a good time. You can play the classic mode or you can create your own custom deck with your own rules. Players add drinks to the “King’s Cup” every time they draw a king, and when the 4th king is drawn the player has to drink the cocktail created by previous 3 kings.